The Suncrest hotel is showing signs of recovery, and better results are expected later this year. Suncrest Hotels and Spanish hotel chain Sol Melia have terminated a 15-year management contract which came into force in November 2001. The announcement came within minutes of the hotel announcing an improvement in its financial performance in the six months up to April. "Suncrest Hotels plc and Sol Melia SA have agreed that it is in the mutual interest of both companies to terminate the management contract," Suncrest said in a company announcement to the Malta Stock Exchange. The hotel will once again be known as the Suncrest Hotel and there will be no further association with the Sol Melia brand. The takeover of Suncrest's management by Sol Melia had been warmly welcomed by the tourism industry in 2001 with then Tourism Minister Michael Refalo describing it as a "vote of confidence in Malta's tourism industry". It was felt that the development could attract Spanish tourists to Malta. Tonio Farrugia, company secretary, explained that the hotel's board had been concerned in 2002 that the Suncrest was performing below the national average for hotels. Following agreement with Sol Melia, the Spanish general manager was replaced by a Maltese CEO, George Schembri, in May last year but the Sol Melia brand name was retained. Suncrest and Sol Melia have since agreed that their association was not bringing the desired results and since additional benefits from that association were not foreseen, the two decided to part company. Mr Farrugia said the hotel was showing signs of recovery since Mr Schembri's appointment and better results were expected later this year. The interim results for the six months up to the end of April show that turnover rose to Lm816,000 (from Lm637,000 in the six months to April 2003). 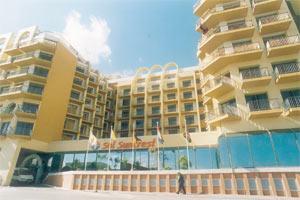 The hotel made a loss on ordinary activities before tax of Lm393,000 (2003: Lm485,000). "The improved performance is the result of a change in the company's marketing strategy which is no longer heavily dependent on the German market but is now focused on the UK market," the company said in its announcement. It said the hotel's management had set out to increase occupancy in the winter months by reducing room rates. This measure had raised rooms revenue by Lm48,165 over last year, which more than made up for the drop in rates. The hotel had also strengthened its share in the Maltese market and placed greater focus on food and beverage operations, specifically targeting conference and incentive groups. Revenue in this sector increased by Lm123,351 over the same period last year. The company reiterated its plans to convert the hotel's sixth floor into timeshare apartments, channelling funds from this development to create a sinking fund to be used for the repayment of the company's bonds in 2007. "The timeshare project will result in a stronger cashflow and will make the hotel less vulnerable to cyclical trends in the hospitality industry." Sol Melia is the third largest hotel group in Europe and owns/manages over 350 hotels. In Malta, it also has a 20 per cent stake in the Costa San Andrea Consortium, which wants to develop the White Rocks tourist complex. The consortium is still awaiting a government decision on its request to change part of the project plans and has threatened to pull out if that does not happen. The government has indicated it may issue a fresh call for tenders for the project. The developers have proposed to alter their plans by scaling down a projected hotel and include a number of residential apartments in the Lm23 million project. "The consortium is ready to embark on the project as from tomorrow provided the conditions reflect the current situation in the tourism industry. The situation has changed from five years ago," Tony Zahra, a director of Costa San Andrea said, adding that Sol Melia remained "very very keen on the project".